Any trip to Liverpool would be incomplete without a stop at Liverpool ONE, an outdoor shopping, residential and leisure complex spanning six districts in the city. In addition to lots of shopping, from high street brands to designer labels, Liverpool ONE offers a diverse range of dining options. Choose to have a classy fine dining experience, a laid back meal in a more casual setting or just grab food on the go. No matter what your preference, you will find something to suit your taste from the wide variety of food and drink outlets spread across Liverpool ONE. A new range of Ben 10 toys has been launched by Flair and you are invited to the party! It is a Twitter party on Thursday 31st August from 1pm to 3pm. I am playing host along with a few other parent bloggers. Remember to save the date and join in on your mobiles, laptops or smart devices using #Ben10Toys to be in with a chance of winning some Ben 10 goodies. Whoever said diamonds are a girl’s best friend overlooked the other significant gem in every woman’s life - pearls! Sophisticated, romantic and oh-so- elegant, pearls are a must-have in every woman’s jewellery collection. Pearls are also often passed from one generation to the next and carry with them a rich history and lots of sentimental value. But time tends to take a toll on these beauties, They actually need treatments to keep them secure and looking their best. Whether your pearls are a family heirloom or just an all-time favourite, they should be restrung as often as once a year. Who else thinks this summer has been a complete washout? We are more than halfway through the school holidays and I can just about count the number of warm, sunny days we’ve had on the fingers of one hand. J doesn’t mind being indoors that much, though cabin fever does kick in after a while. He amuses himself playing with toys or creating with them. Like with the Bunchems! BunchBot. We have had a laugh creating all sorts of 3-D shapes and creatures with this snazzy toy. A rose by any other name would smell as sweet. A concept immortalised by the greatest playwright and author that ever lived, William Shakespeare. Thanks to those immortal words or otherwise, the rose now occupies a very special place in our hearts and our lives as a symbol of everlasting love. Who can resist the charm of a hand-tied bouquet of long-stemmed red roses? There are times however, when a bouquet is not enough. You want to capture the romance of the rose but make it last for an eternity. The Eternity Rose is just that. 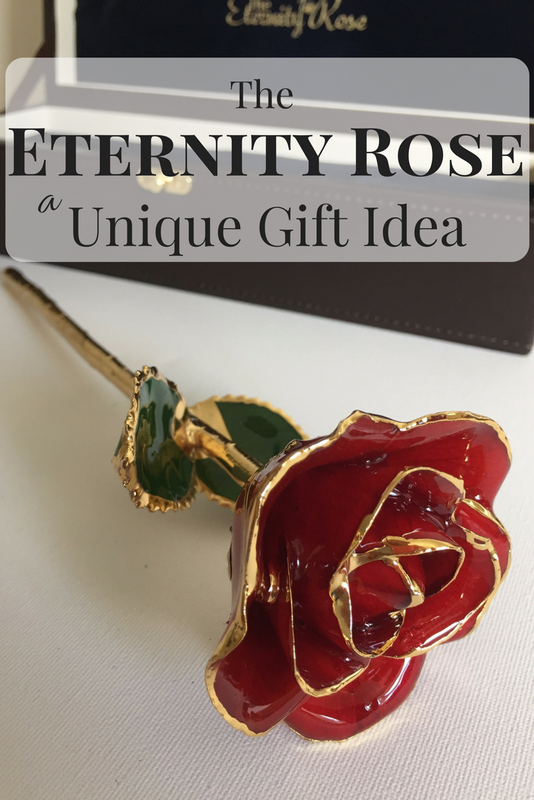 This unique concept in gift-giving comes from a company that specialises in precious metal-coated and glazed natural roses. “Is MOKURU Set To Be The Next Playground Craze?” scream the headlines from many national newspapers. This latest nifty toy has taken Japan by storm and is now headed for British shores. Brainchild of designer Masakazu Node, this handheld wooden toy was designed to test an individual’s balance and focus. Now this simple design is testing the dexterity of fast fingered flippers everywhere. 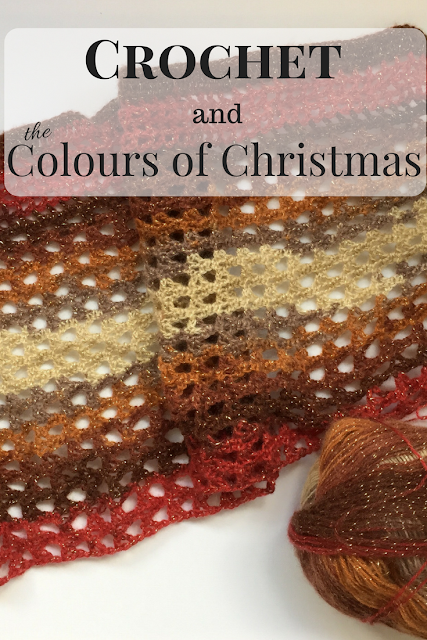 Regular blog readers will know that I have taken up crochet again after a long hiatus. I have enjoyed the calm and focus that it brings, so have persisted with this long-lost hobby of mine. After successfully completing the Sky Blanket, a year-long crochet project that had me picking up a crochet hook after nearly 20 years, I have gone on to finish a few other pieces. Like this ruffle crochet flower and this easy woolly hat I made to keep my ears warm last winter. Early this year, I visited a yarn and sewing exhibition with a friend who loves beautiful yarn as much as I do. She was on a self-imposed ‘yarn diet’, but I went a bit crazy and ended up buying armfuls of the stuff to replenish my depleted stock. One week into the summer holidays and I am still waiting for the sun to shine and me to stop wearing a woolly jumper. No, I mean it. A nasty cold and no warming sunshine means I feel as miserable as if it was the middle of January. With one difference. School is out, J is at home and I have to think of ways to keep him entertained. 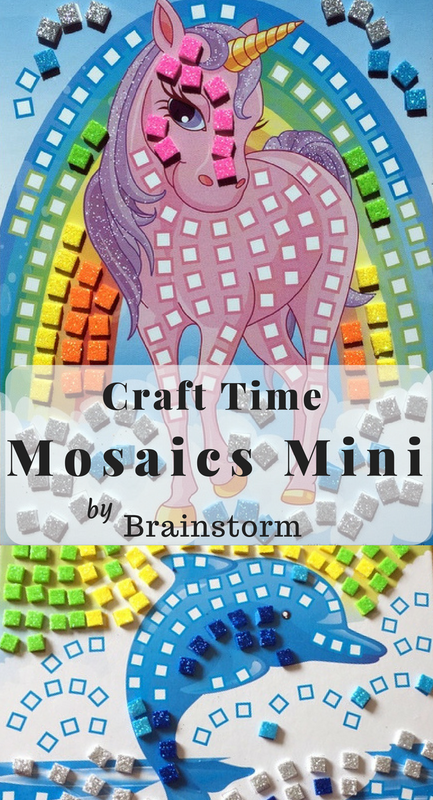 Creating has always been our strong point, so these cute Craft Time Mosaics Mini by Brainstorm fit the bill perfectly. I can’t remember the number of times we have read Julia Donaldson’s Room on the Broom. We bought the 15th anniversary edition a while back and it has remained a favourite since. 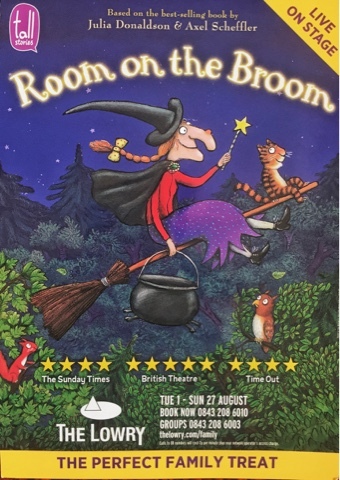 So imagine the excitement when my son found out that we were at The Lowry to watch Room on the Broom live on stage.